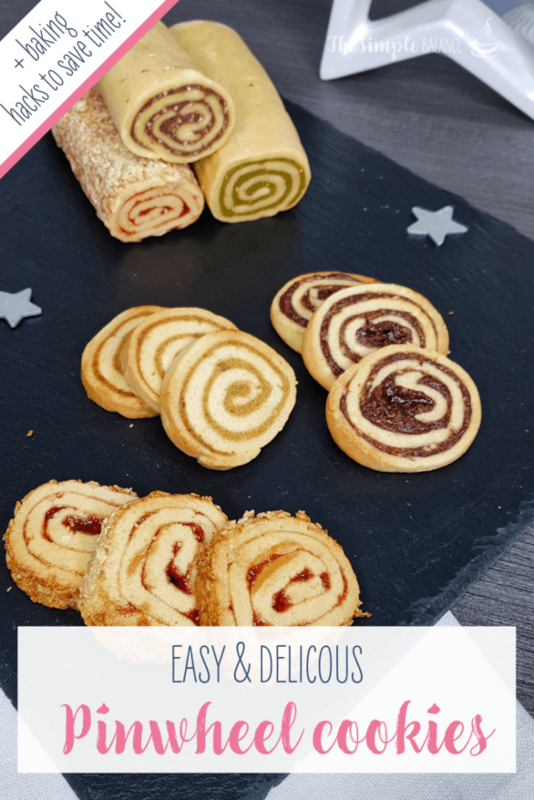 If you love shortcuts when baking, then these slice and bake pinwheel cookies will inspire you! In this article, I will show you four easy flavors which will prepare you for any cookie emergency. 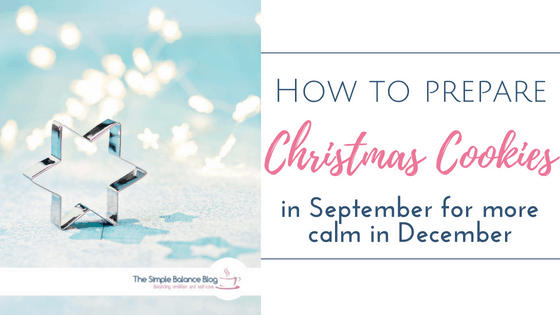 Perhaps you already know my favorite shortcut for less stress during the Christmas season. As long as our three children are still at kindergarten and primary school age, Christmas baking is largely limited to slice and bake cookies. 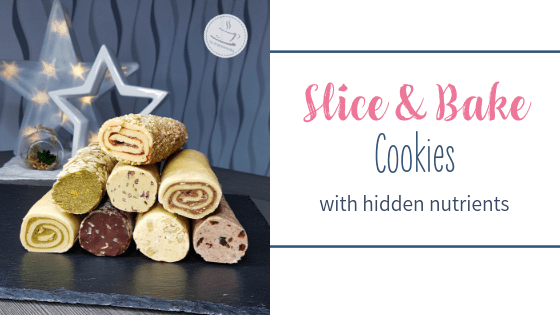 I simply don’t have the energy for intricate cutout cookies and never-ending leftover dough bits… However, there is an unbelievable variety of slice and bake cookies and they are so easy to prepare! I try to prep and freeze them ahead of time until Christmas baking season rolls around. So it was only a matter of time before I had to apply this principle to pinwheel cookies. And tadaa! 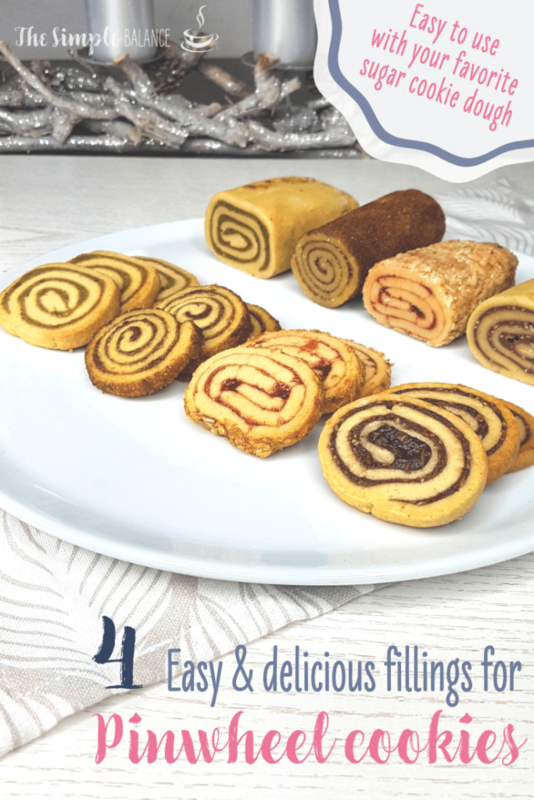 The abundance of different cookie dough logs got extended by four more recipes. Not to mention their eye-catching looks. One thing I really like is not having a huge Christmas cookie jar sitting around for weeks. Instead, we just quickly bake a new load directly from the freezer whenever the cookie mood strikes. The basic cookie dough is the same as in my first slice & bake cookie recipe. But instead of forming it into a roll, it’s rolled out into a rectangle and topped with a filling of your choice. With this version, I first created a simple ganache inspired by this recipe. Don’t let the word scare you away – if you can melt chocolate chips and mix in cream, then ganache is no problem either. Extra tip: Pour hot water into your slow cooker or Instant Pot (about 1.5 inch deep). Add the chopped chocolate or chocolate chips to a heat-resistant jar and place it in the hot water. At the lowest slow cooker setting, the chocolate melts gently. Just make sure that no tiny water drops get into the chocolate. For this filling, add marzipan and pistachios to a food processor and process until finely ground. 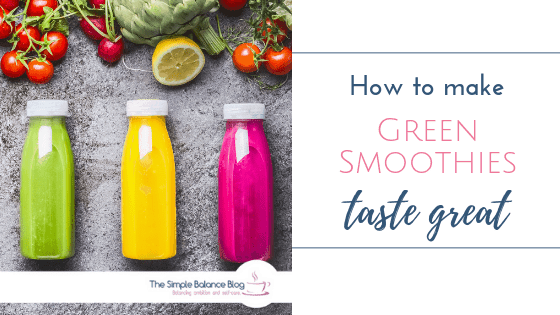 For an extra burst of green color, I added a little green smoothie powder, but don’t worry – nobody will be able to taste wheatgrass, spirulina or spinach! The simplest of all the four fillings is your favorite jam. 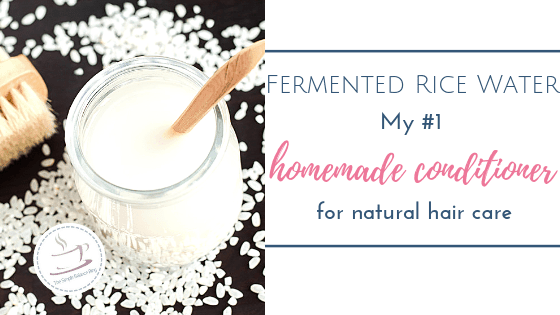 This can be homemade or store-bought – whatever you like to eat (or needs to be used up) is great for this. If the jam is very firm, stir it with a spoon or even a hand-held blender until smooth. This will make it much easier to spread on the fragile dough. After cooling the rolled up cookie log, I brushed the entire roll with jam and then covered it with granola. Again, this is a great way to use up small leftover amounts or a granola that nobody likes on its own. These turned out to be the biggest hit with my family. We love the crunch coming from the granola crust and the fruity gooeyness of jam after it’s been baked! For this very simple variation, simply spread melted butter on the rolled out dough and sprinkle a mixture of brown sugar and cinnamon evenly all the way to the edges. You could also add a cinnamon crust to this version once it had a chance to cool: Brush an egg white on all sides of the cookie dough log and then roll it in the same cinnamon-sugar mixture. 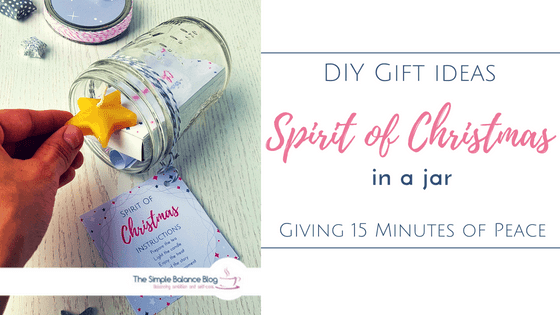 Gently press the mixture onto the log until evenly coated and then either bake or freeze. As soon as the cookie logs had an opportunity to chill for about an hour, they are ready for baking or freezing. Place cookie dough in the hot waffle iron, one slice in each section, and bake until the light turns green. They may still be very soft and can best be removed with a spatula. Once cooled, they will be firm and crispy. With this quick baking method, the pinwheel pattern transforms into a beautiful marbled pattern. If you have a waffle iron for Belgian waffles, I recommend that you stick two slices together in the shape of an 8 before baking. If your kitchen, like mine, has a weak spot for modern devices, an Airfryer may have found its way into your kitchen. And these are great for quickly baking a batch of cookies, too! Depending on the model, you may need to remove the turning device to ensure that your cookies remain undisturbed diring baking. The advantage is that there’s no preheating time and because of the small space, much less electricity is needed. 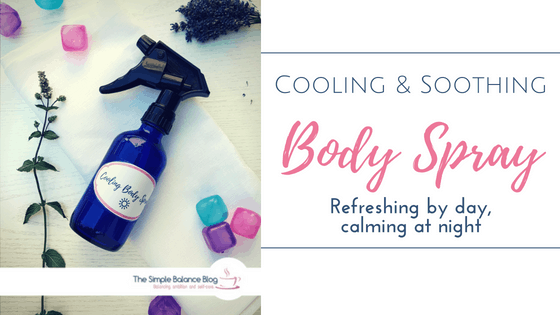 This method is particularly suitable for smaller quantities. I recommend that you watch them when you use this method for the first time, so you’ll get a sense for how long it takes in your Airfryer model. As soon as the edges show a slight browning, the cookies can be removed and left for cooling. Use ready-made sugar cookie dough if you are short on time or energy. This is also a great way to use up the remaining dough after you spent and afternoon of baking cut-out cookies with your kids. I hope I was able to show you, that with a few tricks, life can be organized in a way that it doesn’t look like you made use of shortcuts. That’s how I feel with these cookies. They pretend to be the result of a long, hard day in the kitchen and are done with 30-60 minutes of working time. If you then serve warm, fresh cookies to your unannounced guests in the middle of Christmas season – and without spending any time in the kitchen – then it may just feel like you’ve got this life thing all figured out… 😉 Try it! 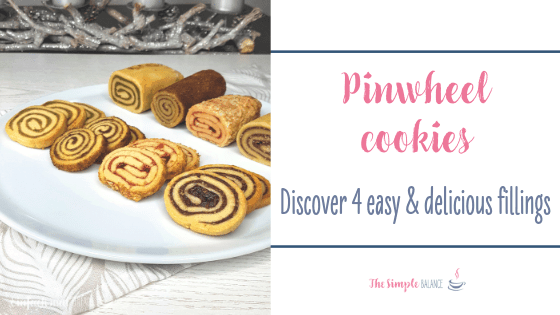 With these four easy fillings, you will create delicious and beautiful pinwheel cookies in no time! Melt chocolate chips or chopped chocolate over double boiler or in your microwave. Meanwhile, heat coconut milk gently until steam is starting to rise and without bringing it to a boil. Pour over melted chocolate and gently stir until combined. Add shredded coconut and salt. Stir until well combined. Cover and place in fridge for 3-6 hours - or your freezer for 30-60 minutes. Once your ganache is firm enough to be spreadable, roll out your sugar cookie dough to about the size of an A4 piece of paper. Spread ganache over rolled out dough until covered right up to the edges. Starting with the short end, gently roll up your dough. Wrap in cling film and cool for another 30 minutes or freeze for later use. For baking, follow instructions below. Add pistaccios, marcipan, milk, vanilla and salt to the bowl of a food processor and mix until it forms a paste. Add green smoothie powder for a more popping green color, if desired. If the paste is too think, add another tablespoon of milk and pulses until combined. Roll out your sugar cookie dough to about the size of an A4 piece of paper. Spread the pistaccio marcipan filling over rolled out dough until covered right up to the edges.. Starting with the short end, gently roll up your dough. Wrap in cling film and cool for another 30 minutes or freeze for later use. For baking, follow instructions below. Using a spoon, stir jam until smooth and spreadable. Roll out your sugar cookie dough to about the size of an A4 piece of paper. Spread jam over rolled out dough until covered, leaving a margin of about 1/2 inch. Starting with the short end, gently roll up your dough. Wrap in cling film and cool for another 30 minutes. If you want to coat this log in granola (highly recommended - these are amazing! ), cover the entire log with a thin coating of jam and roll through spread-out granola. Press gently into the granola and the granola onto the log. Once the entire roll is covered evenly, wrap in cling film and chil for 30 minutes or freeze for later use. For baking, follow instructions below. Melt butter and let cool slightly. In a seperate small bowl, combine brown sugar and cinnamon until evenly combined. Roll out your sugar cookie dough to about the size of an A4 piece of paper. Brush the entire rectangle with melted butter and generously sprinkle with 2-3 tablespoons of the cinnamon sugar mixture until evenly covered. Starting with the short end, gently roll up your dough. Wrap in cling film and cool for another 30 minutes. If you want to coat this log in cinnamon sugar for extra crunch, cover the entire log with more melted butter or egg white. Finally, roll through spread-out sugar mixture and press the mixture gently onto the log. Once the entire roll is covered evenly, wrap in cling film and chil for 10 minutes or freeze for later use. For baking, follow instructions below. Pre-heat your oven to 350°F (180°C) and line a baking tray with parchment paper or silicone baking mat. 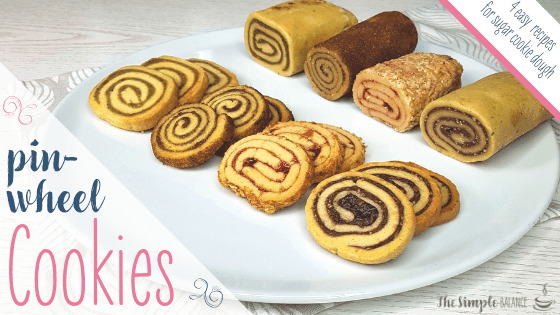 Now, cut 1/4 inch slices off your pinwheel cookie logs, arranging them on the lined baking sheet with a finger's distance apart. Bake at 350°F/180°C for 12-15 minutes and let cool for at least 5 minutes. They will firm up as they cool. The coconut-ganache and pistaccio marcipan filling will make enough to create at least two pinwheel logs. Leftovers will keep in the fridge for several days and is also extra delicious as a sweet spread on your toast! If you’re struggling with depression and anxiety, this is the most important self-care tip for your mental health. It will change your life. I’m one of those people with a tendency towards depression and anxiety. 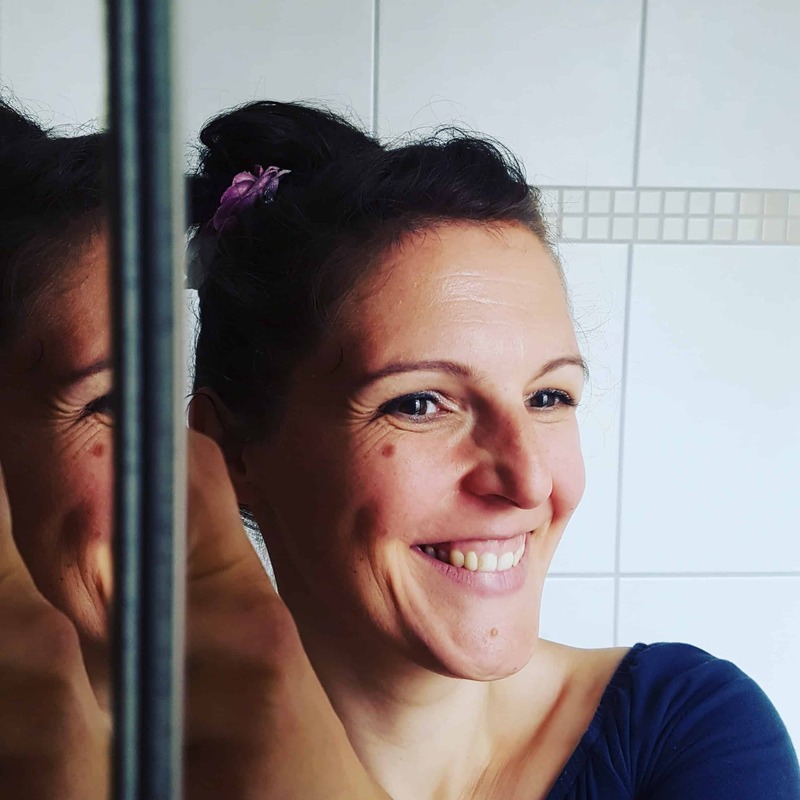 As a highly sensitive person, I’ve had my first burnout experience in my early twenties. 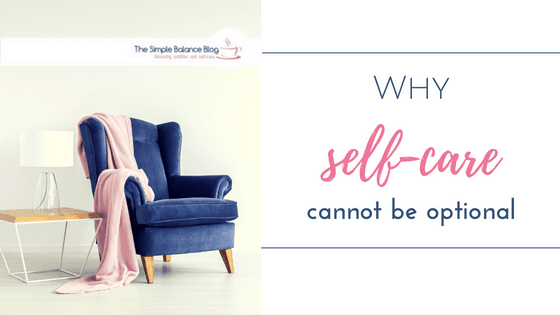 Over the years, this very potent combination of mental health challenges led me to take a rather unpopular step in the self-care department. 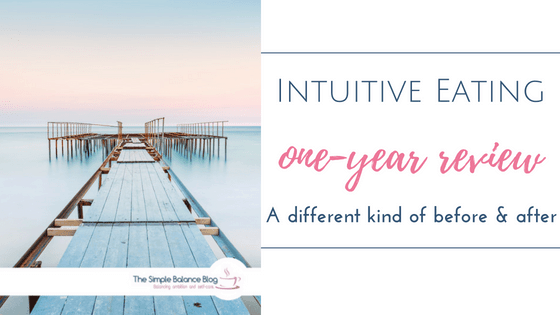 A step that frequently causes disbelieve or head shaking. 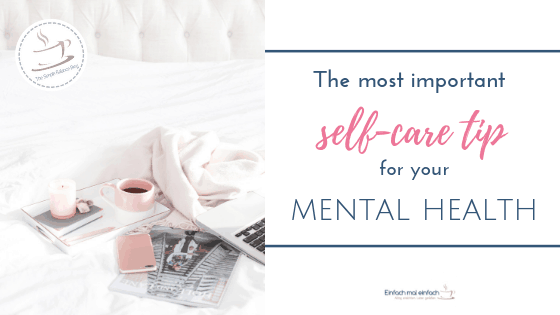 But this one simple self-care tip has had the biggest impact on my mental health. I don’t follow the news.